André Leu, President of International Federation of Organic Agricultural Movements (IFOAM), the world umbrella body for the organic sector. IFOAM has approximately 800 member organizations in 120 countries around the world. He was the Chair of the Organic Federation of Australia (OFA), the peak body for the Australian Organic Sector and Chair of the Far North Queensland Lychee Growers Association. Leu has extensive publications in such outlets as the New Internationalist, The Journal of Organic Systems, Acta Horticulturae, The Journal, American Bamboo Society Journal, Heartwise, Wholly Organic, The Organic Way, The Organic Standard, Ecology and Farming. 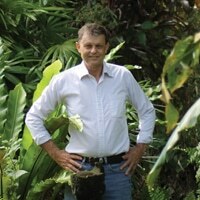 He and his wife, Julia, own an organic tropical fruit orchard in Daintree, Queensland that supplies quality controlled fruit to local and international markets. Caryn Hartglass: Hello everybody it’s time for part 2 of It’s All About Food. I’m Caryn Hartglass and it’s October 7 2014, My next guest is the president of International Federation of Organic Agricultural Movements IFOAM, the world umbrella body for the organic sector, IFOAM has a approximately eight hundred member organizations in one hundred and twenty countries around the world, he was the chair of the organic federation of Australia, the peak body for the Australian organic sector, and chair of The Far North Queensland Lychee Growers Association, he has extensive publications in outlets such as New Internationalist, The Journal of Organic Systems, Acta Horticulturae, The Journal American Bamboo Society, Journal Heartwise, Wholly Organic, The Organic Way, The Organic Standard Ecology and Farming. He and his wife Julia own an organic tropical fruit orchid in Daintree Queensland, that supplies quality control fruit to local and international markets. Andre welcome to It’s All About Food. Andre, can you tell me how to pronounce your last name, I didn’t want to say it because I didn’t want to say it wrong. Andre Leu: Okay its Leu, l-e-u, it’s the same eu as Freud or Deutsch, it’s the German way of pronouncing. Caryn Hartglass: Okay, I was not going to say that Andre Leu, well thank you. Andre Leu: I get called lots of things. Caryn Hartglass: I imagine, okay, you have a new book and it’s all about the myths that were being fed, the myths of safe pesticides, we talk about this a little bit from time to time on this program and I’m glad that you’ve written, what you have, very often, I focus not on the safety of genetic engineering as an example and it’s link to needing all the pesticides and herbicides. I talk mostly about what’s wrong with farming today on so many levels because it’s hard to find all the science, but you’ve put it all together in one book that shows how bad it is. Andre Leu: Thankyou for that, it’s actually for me, this has been a very important project, because most people are told that pesticides are used safely and that there’s very good science behind the testing, and we have nothing to worry about with the pesticides in our food, so I really wanted to investigate that because a lot of the anecdotal evidence we have shows it’s the opposite, so I started to look at the science, and the published peer reviewed science, and found that there are hundreds and hundreds of studies that our regulators such as the USEPA are ignoring and instead there basing their conclusions on what I call data free assumptions, they’re making their decisions on assumptions and not on published peer reviewed science. Caryn Hartglass: Well, I went to college and I became a chemical engineer and in my training we were always taught to assume whenever we were trying to figure things out, the first thing we had to do was list all our assumptions, it’s like in the training, assume this and assume that, but at some point you really have to get, you can’t just make things up. Andre Leu: Look exactly and this is one of the things I’m putting out in my book, is that good science is based is on evidence based data, and good science is where they publish it, it’s in peer reviewed journals so that other scientists can look at that data and repeat it to see if the conclusions are correct, what is happening in this case is that there are assumptions being made about the toxicology of these products they use in our food that have no basis in science, so instead of being science based decisions, these are just data free assumptions, which you know from our point of view is totally wrong because regulators have a duty of care to protect the public from these toxic chemicals. Caryn Hartglass: Now when you’re talking about pesticides, you’re including the whole package, insecticides, herbicides, fungicides. Andre Leu: Exactly, it’s all the ‘cides. Caryn Hartglass: All the ‘cides. Andre Leu: Exactly, it’s a generic word for the whole lot, so and I explain that in my book, so people can understand when I’m using pesticides, I’m talking about all the different various compounds that are toxic compounds that are used in our food supply. Caryn Hartglass: Now one thing you mentioned in your book, which really started giving me chills and I know that it happened, is that the little testing that we do is on singular chemicals, singular ingredients, and we live in a world where everything is mixed together, and there’s all different things happening and we don’t test the combinations of things that people will experience. Andre Leu: That’s one of the key things that I point out, that the testing is based on one single ingredient in a pesticide formulation and they call this the active ingredient, but all the products that are sold and used are formulations of many different compounds, many of them are quite toxic and we have very good data of what we call synergistic or additive effects, that when you add these together, they are far more toxic and that the limited testing we do have is looking at 300 to 1000 times more toxic than the single ingredient. Caryn Hartglass: That’s pretty scary. Andre Leu: The other part is, not just the fact that every registered pesticide that is used in the world is not tested for the complete formulation in terms of long term diseases, such as cancer, nerve damage, what we call neuro development, toxic neuro development, damaging children that lead to things like ADHD, other behavioral problems, endocrine disruption, I can go on naming all the different types of diseases that are caused by pesticides that are not tested for, the actual product that is sold, there is no testing for these, the other one is the fact that several different types of pesticides are approved for one crop, so for instance, it might be several insecticides, several types of herbicides, several types of fungicides, microcides, and they’re all used and when we look at the testing of food, most products will have multiple pesticide residues and there’s no testing of those combinations either. Caryn Hartglass: Well it’s expensive and takes a long time to do those tests, and they want to get their products out and make money. Andre Leu: Exactly and of course the other side of it, it’s a win win because of all these diseases, the same companies can sell all the cures for it as well. Caryn Hartglass: Oh yes, the quote, curists. Andre Leu: Exactly, so it doesn’t get better than that as a business model. Caryn Hartglass: Now one of your other myths is that pesticides are essential to farming and we hear this a lot, we hear this about the green revolution, and how wonderful it was and now its left us with parched earth, I can’t grow anything, I was speaking with Eric Lee-Mader last week from the Xerces Society, are you familiar with them? Andre Leu: No I’m not. Caryn Hartglass: Well we talked a lot about farming and beneficial insects, and just listening to what they’re working on in the book that just came out, it’s just incredible, what a beautiful world we can have when we choose to work with native plants, wild flowers and grasses and encourage those insects that will do the work with us, rather than against us without using pesticides. Andre Leu: Exactly and I actually go into that in the book, we call this eco function and cancer furcation[? ]8.58, where we work with functional biodiversity and bring that into the system, and that can give you the ecosystem services such as pest control, in other words we can bring in plants that are the hosts of the beneficial insects, put that into our system and they will control the pests, without having to use toxic chemicals and this is really the future of agriculture, we started working with agro-ecology, start using ecological science and make an agriculture that is much better for the environment, we increase the biodiversity and what we know now, we can actually increase food production and make it far greater than the amount of food that we’re producing at the moment. Caryn Hartglass: It’s a win win, if we would only go that way, so how does it look so far, is this message getting out there? Andre Leu: Sorry, we have very good science at the moment showing that now that we’re getting research into organic systems, that you can get much higher yields out of organic than conventional, and that includes studies in the United States, where conventional is already high yielding, but the really exciting one is in the developing world, where most of the hungry people live, there’s about eight hundred million people who do not get enough food every day and there’s another billion that get enough calories, but they don’t get enough essential micronutrients, vitamins, antioxidants, minerals, etc. Caryn Hartglass: That’s most people in this country. Andre Leu: It’s the same, the world over now. They get more than enough empty calories but they don’t actually get enough nutrition, and but what we know now is that around most of these people, are actually small holder farmers and they’re not producing enough food, and with good organic techniques we’re able to give them more than a hundred percent increase in food production and that takes these communities from abject poverty into relative prosperity. Caryn Hartglass: Oh I love that. Andre Leu: Yeah look, it’s one of the really good success stories, there’s a very good study done by two united nations organisations, united nations environment program and united nations conference on trade and development, and they reviewed one hundred and fourteen projects across Africa and it was over two million hectares, that’s five million acres and just under two million farmers and they found on average with good organic methods, there was one hundred and fourteen percent increase in yields and that meant, it meant that these people now were food secure, very importantly they could send their children and especially their daughters to school, it’s usually the daughters that don’t get educated, they can afford medical bills, they could build nice houses, they could actually socialize, some of the stories you hear which you don’t think of the women, because they can’t afford decent clothing don’t want to socialize, because they feel embarrassed or indecent, they can have nice clothing, they can socialize, this whole sense of community, the children start returning back to the villages, because there’s a future it just changes everything around, and the thing about this is that it just needs training and education, we don’t need to waste billions and billions of dollars developing a new GMO or something, that money can be used to help the most marginalized people on our planet and turn it around and build really vibrant happy functioning communities. Caryn Hartglass: That’s probably the most frustrating part for me of the genetic modified science where they say that they’re doing this to feed the world and we know how false that is, and even if they did come up with some magic plants, it’s all about distribution and educating people on what to do and without that they’re not going to change at all. Andre Leu: Exactly and the thing is the type of business model that they’re looking at which is agribusiness, big broad acre farm production in the USA, Brazil and my country Australia, it doesn’t work, because at the moment the world is producing two and half times the amount of food we need and that food is not getting to the people who need it for a very simple reason, if for instance you use an example of a farmer in say Malawi and Africa who is food insecure, it doesn’t matter how much genetically modified soy beans we grow in Brazil, it won’t get to them simply because they’ve got no money to pay for it, but a factory feedlot in china feeding cattle has got the money, and instead what happens is those soybeans become very expensive meat for the middle and upper classes in developing countries, so it’s completely faulty model, what we have to do is go back to food sovereignty, local food systems and improved production in the areas, in the actual communities where we need to increase food production. Caryn Hartglass: You know another interesting thing, there are so many benefits of organic food production versus industrial food production, I don’t like to use the word conventional, which we do here in the states, there’s nothing conventional about pesticides. Caryn Hartglass: It’s that it takes a lot of fossil fuels to make those chemicals, and that puts carbon dioxide and other greenhouse gases into the environment and warms us up. Andre Leu: Exactly, the sort of work that’s been done now looking at agriculture, the latest figures are showing that agriculture is responsible for around thirty percent of greenhouse gases, and a lot of that is the energy used fossil fuel energy used to make fertilizers, also a lot of those fertilizers, particularly the nitrogenous ones become even greater greenhouse gases, but we also have now very good data showing that organic systems because we can sequest the CO2 and put it in the soil as organic matter, as carbon, we can reverse our climate change, we can actually strip it out and turn farming from one of the major problems to one of the major solutions for climate change. Caryn Hartglass: And one of the saddest things about pesticides is how it impacts children’s health. Andre Leu: To me that is saddest and most critical thing, I put a lot of emphasize on that in the book and it to me, I suppose this is one of the greatest crimes that our civilization is doing, is that we are effecting our next generation and we know now that this will, this actually affects generations to come, problems that people experiencing at the moment can be due to their grandmother’s exposure to pesticides. Caryn Hartglass: We’re just at the tip of the iceberg. Andre Leu: Exactly and what we’re seeing particularly is the unborns, the fetus, they are very vulnerable to smallest amounts of pesticides and we know now can be in parts per trillion, and just so that listeners can understand what a part per trillion is, if I have three Olympic size swimming pools full of water and I put one drop in that, that’s a part per trillion, so what we’re trying to get across here is this idea, look it’s so the levels are so small it won’t hurt you is a nonsense now with what we know, with the science and at particular times, when the fetus is developing they need those levels of small hormones, parts per trillion to develop the normal organs and tissues, the reproductive system, the nervous and brain system, limbs, body parts, and it’s that sensitive, now if another chemical interferes with that, then it changes the way the fetus will develop and we know these are programing events to, so it can effect this individual for their whole life and it is a major issue, because we also know the amount of chemicals now that are crossing the placental barrier for instance, the environmental working group did a study looking at the amount of chemicals in the placental cord blood of newborns and they found up to two hundred and thirty two chemicals. Caryn Hartglass: And it’s not like these chemicals just disappear and go away once we’ve used them. Andre Leu: Exactly and this is the other really critical thing too, because we get told the modern chemicals aren’t like the bad ones, like DDT, they rapidly break down, what they’re not saying is many of them actually break down so they’re even more toxic for instance than these organophosphates, they break down to these oxins and they can be a hundred to three hundred times more toxic than the original product, so yes it’s broken down, but yes it’s far worse and there’s no testing for these metabolites. Caryn Hartglass: That’s right, okay, Andre, we just have a few more minutes left and I thought we would turn to some more positive things, I want to know what kind of fruit your growing in your orchid in Australia. Andre Leu: Okay, it is far more positive, I grow tropical fruit, so you mentioned lychees, I have a lot of different types of lychees, but the other ones I grow are fruits that mostly come from South East Asia, like rambutan, it’s a lychee with sort of long hairs on it. Caryn Hartglass: I was just going to ask you if you grew those, I love those, I’ve had them in Costa Rica, I just saw them in the whole foods the other day and they looked all dried up and horrible, but when you get them local they’re lovely. Andre Leu: When they’re fresh they’re beautiful, and the other one you would have seen in Costa Rica are the purple mangosteen, the queen of fruits, that’s one of my favorites, I grow that and the other one which is also one of my favourites, but can be controversial for people who don’t know, it is the durian, the big spiky fruit with a very strong odor. Caryn Hartglass: Yes, I’ve never been fond of those. Andre Leu: It’s, for me and others it’s an aficionado fruit. Caryn Hartglass: I know people go nuts over them. Andre Leu: You either love it and adore it, or it’s the other way round. Cary Hartglass: Or you don’t, Yes. Andre Leu: It is very strong and then I grow a range of other fruits, I have about thirty acres under tropical fruit trees. Caryn Hartglass: Beautiful, well what amazes me is when I taste fresh food, fruits and vegetables grown organically with care, the flavors are so incredible, they taste so like nothing like you’ll find in a store selling industrial conventional produce, and why do we want to miss that, life is short, every bite of everything should be just luscious. Andre Leu: I couldn’t agree more with you, I think one of the sad things now is we’ve turned food into just a commodity, when food is one of the most, one of the main essential things in our life, and food is something that should be celebrated and enjoyed in every meal, and I agree there’s nothing better than fresh good food with a wonderful flavor and texture. Andre Leu: And color as well, I agree. Caryn Hartglass: Okay well, we just have a minute left and I just wanted to say again The Myths of Safe Pesticides, this is your new book and I’m going to use it I think very frequently as a resource, because there’s so many great facts in here cited, all these different things that have been discovered about what pesticides are doing to us all over the world, so thanks for putting that all together. Andre Leu: My pleasure and thank you so much for having me on your show, I really do appreciate it. Caryn Hartglass: I’m sorry I missed you when you were in New York, but I was not in New York when you were here. Andre Leu: Okay no, I was in New York in a very good time because of all the climate convergents and the climate marches, so I did enjoy and the other thing I always enjoy is this time of year in the north east of the states, it’s just absolutely glorious, had a great time. Caryn Hartglass: Yes so let’s try and keep it that way, we want to keep this world beautiful, all right, thank you Andre Leu. Andre Leu: Look thank you so much Caryn, I really appreciate it. Caryn Hartglass: Okay I’m Caryn Hartglass, you’ve been listening to It’s All About Food. The Myth of Safe Pesticides this is a very important ground breaking book, if you want to get all the facts it’s all in this book, so, send me an email at info@RealMeals.org when you have a chance, if you have any comments and questions, and visit me at responsibleeatingandliving.com and remember, have a delicious week.